This is the only News app I have with this arrangement, In all other Nabble forums I maintain Smart App Pages work and sub-forums are hidden from view, for those users who lack the appropriate permission, but on this forum Anyone can see it exists (even if they can't access it, without logging in as a user with the required group membership. Are "Smart Application Pages" intended to work with sub-categories of the "News" app? I have tried changing the "Archive" app to a "Forum" app but is still visible to unauthorised users. Can you post a link to an example of this so I can compare? This is a Mixed app with a hidden "Developers" area, only visible when logged in with an id that includes the "Developers" group. A Category App. The only sub-forum visible to "Anyone" members is "News". When logged in as "Members" you can see several additional areas. When logged in as "Administrator" you can also see "Moderated Messages"
Does seem to be working as expected now! Initially I thought this had similar problems as "Community Scene" but over the course of the evening I have decided that the issue is simply that many settings were not sticking. The only setting that is now not sticking is the Preference "Page Layout - Narrow". I set it. I log out. only to discover that the app is in "Wide" mode, with the sidebar. I log back in go to Preferences only to discover that the dialogue still claims to be in "Narrow". When I click "Apply" the sidebar disappears. But next time I log out (so I can rtext things with a different user with different permissions) I find the sidebar returns. I see this site as Narrow Layout. Are you still having this problem? It's hard to debug flaky issues that can't be reproduced reliably. 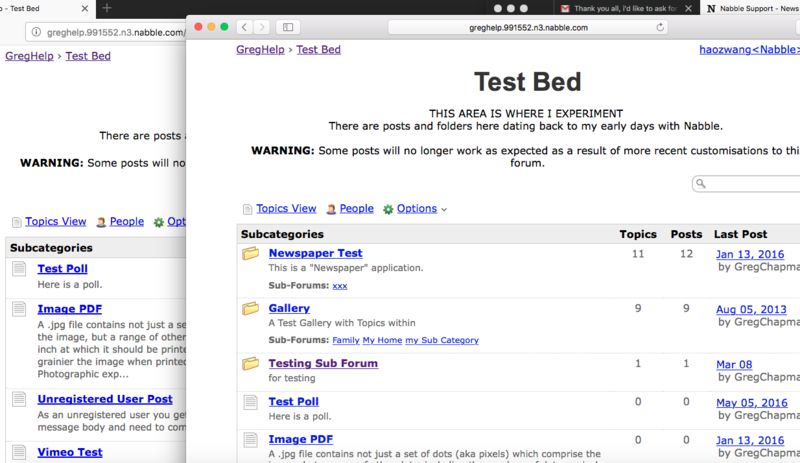 You can create a test site and see if there is a way to reproduce the problem of settings not stick there. Then I can play with it without messing up a real site. Yes, Seems OK now. Apologies for the premature support request. Guess it was a dodgy Internet connection causing my problem. It did drop out a couple of times last night. Guess I hadn't realise it at the time I made the post. Abandoned a copper connection here in rural UK three years ago, replaced it with satellite but it's not always reliable so bring on full FTTH (Fibre To The Home)! I tried to create a "Prayers Archive" sub-forum of "Our Prayers". However, it stubbornly remained visible to all groups of visitors. So, for the time being it has been moved to be a sub-forum of the root application. This is a somewhat complex forum as only certain sub-forums are embedded. Most remain inaccessible to all except a limited number of different users. Feel free to add a test sub-forum under "Our Prayers" if you need to! I can always edit it as required if you get it to work properly. so your new sub-forum is not responding to the Smart Pages option - the key bit for which I am seeking a resolution! As both a registered user and a member of the "Prayers" group when attempting to access the sub-forum I got an "Access Request" screen. I checked the permissions and noticed that the "Prayers" group did not have the "View" permission set. I rectified that and now my test user can enter the "Testing Sub-Forum" and reply. So everything is behaving in the way I reported when I raised the issue. The point about "Smart Application Pages" is that it is meant to hide the existence of a sub-forum from unauthorised users, not just prevent access. I thought the feature worked well when a "Mixed" app is at the top level, but I have just done some tests and realise I was mistaken and it is working in the same way as with the Category app. I think it must have been the choice of sub-forums that I happened to hide in that app that made me thought it was working at all levels. I have now confirmed the same behaviour in my GregHelp forum having set that up with deeper levels that are meant to be hidden but remain visible. Can we do any further tests there, so I can remove the test forum from the live site. But you have already tested that! The GregHelp forum http://greghelp.991552.n3.nabble.com/ has been set as a Category app since you created the two test sub-forums. Smart Pages work at the top level, and your test sub-forum at http://greghelp.991552.n3.nabble.com/Testing-Sub-Forum-Top-f4012782.html remains invisible unless you are logged in in a group with the "View" permission set. has the "View" permission removed from all groups but remains visible as a folder and attempts to enter it reveals the "Access Request" screen (if not logged you see a "Login Screen" before being presented with the "Access Request" screen) - i.e. it behaves as if "Smart Application pages" is not set. that is the behaviour that we need to change. All levels in a form should respond to "Smart Application Pages". I get the same result. When not logged in at all or logged in as my registered test user even those sub-forums supposed to be visible disappear. However, when logged in as an Administrator I can see all sub-forums as expected. I have just returned the Test Bed sub-forum to be a Forum app and all returned to the previous position - the supposedly invisible sub-forum remained visible to my test user. So inspired by your change of app, I changed the TestBed sub-forum to a News app. When visiting as user without View permissions all still works as intended at the top level. But in the TestBed ALL sub-forums remain visible. I have also set it as a Mixed app and the situation is the same as when set as a Category app. All sub-forums are invisible, including those meant to be visible. As a Blog app I get an additional problem. The sidebar appears below the topics, not beside them (on the Android tablet on which I'm currently working) but the visibility issue is the same as with News. So the bug is much worse than I had realised affecting the different app types (with or without sidebar) in two distinct ways. The Blog app sidebar issue only appears when I am logged in as Administrator. I'll test on other browsers later.